While the proper installment of gutters might be something most homeowners leave to the professionals, it is important to keep up on the maintenance of your home’s gutter system. It’s advised to clean gutters once or twice a year, – whether you do it yourself or hire a professional. Keeping gutters clean and unclogged is the number one thing to remember. Clogged gutters are useless – it’s as simple as that. It’s like having no gutters at all! It is easy for leaves, moss, twigs and other debris to be swept off the roof and into the gutters and downspouts. Blockages lead to overflowing, which leads to a variety of problems for you and your home. Here is a gutter that’s pulled away from the house. Fix these problems as soon as they occur and your gutters will work more effectively and last many years longer. The first and most obvious issue with gutters filled to the brim with leaves, twigs, and other debris is simply a weight problem. When that debris gets wet it absorbs the rain water like a sponge and becomes extremely heavy. This burden puts stress on the gutters and their hanging brackets, and can pull the gutters off the house. 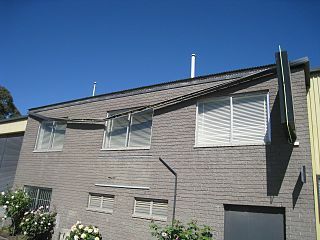 Gutters commonly fall off during the winter due to water getting in between the gutters and the fascia. When the water freezes, it pries the gutters away from the home and they fall off. Falling gutters are costly enough to replace on their own, not to mention any lights or windows they might smash as they come crashing down. Even if your gutter doesn’t fill to overflowing each season, leaving any decaying debris in there is an invitation to carpenter ants and mosquitoes. Overflowing water from the gutters can also damage the paint and siding on a home, but unsightly water marks down the side of the house pale in comparison with what happens if the water get inside of a wall. Wet wood rots and loses its integrity, and this can go unseen behind the siding until it is too late. Rotted wood can also take away from the aesthetics of your home, and is very expensive to fix. In Minnesota, ice-damming is another major issue with clogged gutters. Blocked water can freeze when it backs up in the gutters, pushing up against the roof structure and working its way under the shingles destroying the wood, causing even more leaks. Even flooded basements and cracking foundations are other symptoms of clogged gutters. If water isn’t drained away from the house and it pools around the foundation it will expand when frozen and cause cracks which lead to floods in your basement or crawl space. It doesn’t take much more than one decent rainfall with clogged gutters to cause irreparable damage to a normally dry basement. Water in your basement is most likely to occur during periods of heavy rainfall, or when snow is melting rapidly during a spring thaw. Flooding into the foundations, basement or crawl spaces can cause erosion around the house and permanent damage to the structure. And since many insurance policies do not cover damage from flooding, in is vital to have a method to keep the water away. If properly maintained and cared for, a home’s gutter system will serve as an important tool in protecting your home against the elements. Be diligent when it comes to repairs and cleaning. Just like any other part of your home – routine inspection can help solve problems before they start. Installing seamless gutters is a fairly inexpensive way to protect the structure of your house and ensure a sound foundation. You can also install gutter guards to stop this build-up and avoid this chore all together. No longer will you need to spend hours perched on a latter pulling grimy muck out of your gutters.